Teaching the difference between “I want” versus “I need” is a constant struggle for parents with their kids. Although some of the best things in life are free, there is plenty that costs money. Kids may realize their parents have jobs to pay for these things, but unless they have an unlimited supply of money, understanding how to prioritize spending is also a critical concept to understand after basic money concepts such as what is money and the value of coins and dollars. Family Education published an article stating, “The two main skills that children need to know when it comes to money—and the earlier, the better—is being able to identify money and being able to tender money and make change.” The important concept to convey to your child is that money is based on the dollar. Coins are merely fractions of that unit; bills are multiples of that unit. One hundred pennies, or one-cent coins, make up a dollar; Twenty nickels, or five-cent coins, make up a dollar; and so on. We recently had a chance to review Money Bags, A Crazy Coin Counting Game from Learning Express. It’s a “banking bonanza” as players collect, count, and exchange money all the way to the finish line. Players learn all about making values using various coins and bills: Can you make 13 cents without using dimes? How about 32 cents without using quarters? Land on the $ space and—cha-ching!—you’re in the money! Better hurry: whoever reaches the finish first receives a bonus. Earn more money than your fellow “investors,” and you win the game, money bags! Eight separate rows make teaching money combinations and values a snap. Plus, storage pocket on reverse side keeps all your coins and bills handy! 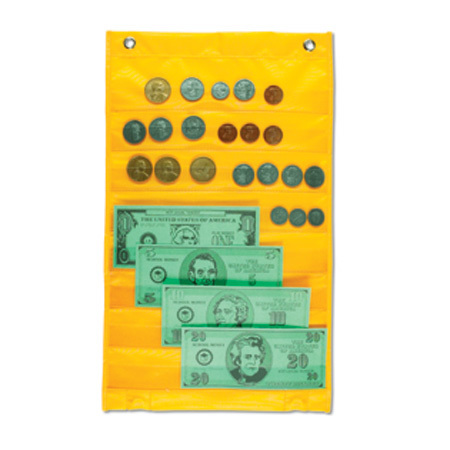 Durable nylon chart with grommets includes set of 115 plastic play coins (40 pennies, 40 nickels, 20 dimes, 10 quarters, 5 Sacagawea dollar coins) and 50 play paper bills (20 ones, 15 fives, 10 tens, 5 twenties). Coupon Clipping: Create coupons for items at a pretend store. Have the “cashier” tell you how much you saved. Bundling: The “seller” creates groups of similar products that are discounted when bought together. Have the “shopper” say how much they are saving. Bargaining: Have the “shopper” assess how much money they have and what they want to buy, then bargain with for what they want based on what they can afford or based on their perceived value. Money Bags game is recommended for ages 7 and up. Perfect for family game night or the classroom.